As PR professionals continue to cling to using AVE as an evaluation metric it makes me wonder do they protest too much? Is the evidence for an alternative really so weak? After much research in the area and involvement with the international Association for Measurement and Evaluation of Communications (AMEC), here is a handy overview. The US Institute for PR (IPR) has also taken a strong position against AVE, as far back as 2010 in this news piece. The table highlights the absolute control of advertising on a paid basis. In contrast, PR has no such control and at best only partial influence over content. To create influence typically takes much effort in planning and media relations – and the mediated nature of journalism will seldom allow that influence to be absolute. AVE takes no account of credibility differences between editorial and advertising. Indications from studies suggest credibility varies over time and by topic – further suggesting there is no fixed multiplier, as used in AVE.
Advertising is a controlled message whereas PR is not – so the content of the article is critical to analysis of its value. Further, messages in advertising are homogeneous and repeated whereas PR does not work in the same way. 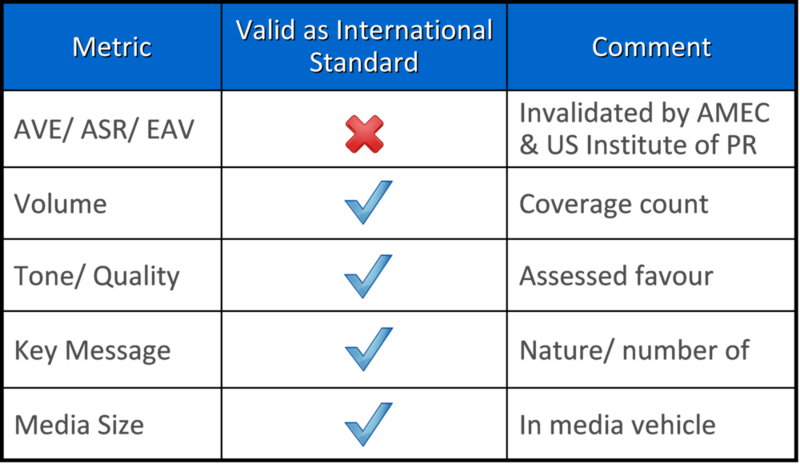 AVE takes no account of the quality of coverage as in its tonality, key messages or spokesperson effect. Unfavourable PR coverage typically does not discount AVE, nor does neutral coverage get rated as zero AVE. There is no rigorous proof that the space occupied x the ad rate of an article equates to any metric reflecting influence on a target audience. AVE cannot measure social media forms, such as blogs or tweets. Dr Brad Rawlings of the IPR Commission on AVE made the point in this piece that Advertisers don’t use the cost of placing their ads as an outcome. Rather they measure results by brand metrics or sales results. So it makes no sense for public relations to compare its outcome to the cost of achieving advertising inputs. The underlying motivation for a dollar figure from PR evaluation is the desire for PR to value itself in proper business terms. However AVE is clearly not a valid answer to that call. The Institute for PR in the US point out that when public relations professionals speak of ROI, or the “return on investment” of a program, they often refer to non-financial measures like mindshare, traffic, message penetration, or the number of fans or followers a company earns via social channels (see here for more). This implies the essential role of media content analysis to understand the impact of coverage. Further depth can be found in our strategy presentations here. Deploying this approach means understanding what metrics to use, tracking these regularly then aligning them with brand and business responses. Such a holistic approach to evaluation offers a valid, stepwise way to connect PR to business results. This model helps illustrate how to achieve that success in your evaluation. For a holistic solution, the model can be adopted as an umbrella approach to integrate metrics across comms efforts and platforms. Such an approach is a valid and comprehensively powerful way to elevate PR to the status it deserves at board level. We look forward to hearing your further thoughts.